A Space Docker in GTA V.. 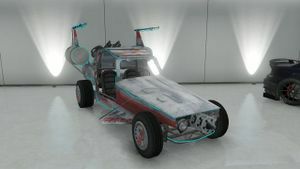 The Space Docker is a special vehicle featured in Grand Theft Auto V.
The Space Docker is a customized sandrail Dune Buggy, manufactured by BF. The vehicle mimics as a spaceship or UFO, with bright blue LED lights wrapped around the exterior, custom wings and fins on its sides and rear, metal trash cans being the SSMEs, and body panels painted white and red. Thanks to its light weight, the Space Docker has the ability to glide short distances, which references its spaceship-like theme. The Space Docker also has a unique engine sound similar to a stereotypical UFO. Otherwise, the speed and acceleration are similar to the Dune Buggy. After you collect all 50 Spaceship Parts, the Space Docker becomes free to take at Omega's garage. The name "Space Docker" references the sexual act known as "space docking." The Space Docker's red and white paintjob and "wings" are reminiscent of the X-wings from the Star Wars film franchise. This page was last modified on 28 April 2014, at 00:12.